Non-Diet Tips: A Diet For Life? Like most other people, I am always faced with someone around me looking for the ultimate answer to weight management. Often the answer which most people expect is in some form of diet recommendation or extreme calorie restricted meal plan. For many Nutritionists it’s therefore easy to succumb to the Diet Doctor role, because that’s what people expect and it's where the demand and cash is. Diets are often geared towards short term weight goals. So they have their purpose. However, in the case where someone gets wonderful results from a diet, there is often that awkward post-diet period where the weight has been lost, but the person doesn’t know how to or is not willing to let go of the diet.Even if there has been no desirable results, the tendency is to get on another diet. Although, it can be hard to break free of the routine of such structured eating, one has to ask themselves the question “Can I or do I want to be on a Diet for Life or for any extended period of time?” Especially when undergone for extended periods of time I've seen dieting easily lead to Anemia and reduced nourishment in some form or the other. It makes sense with such aggressive elimination and restriction of individual or entire groups of foods, and not to mention the 'laxative' diet teas and questionable 'magic bullet' concoctions. Although diet bars, shakes etc have evolved somewhat they are no substitute for real food. 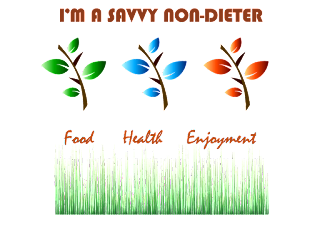 The Savvy Non-Dieter advocates things like regular meal intake without skipping meals or starving oneself, incorporating the most healthy forms of carbs, protein, fats in the diet, eating mindfully with attention and purpose, portion size awareness, increasing appreciation and understanding of the food we eat (quality and wholesomeness, freshness, sustainability, organic certification status etc. ), among other things. It pays to be a Savvy Non-Dieter, not simply as a type of defiance against all things diet. It’s about being empowered to more often bring quality of life and quality food encounters to the forefront of our eating experiences. It pays to be a Savvy Non-Dieter in a Food Phobic World.